Featuring two independently operated folding knife blades, this piece can transform from a single edge to a double edge on a whim! You can pick the configuration needed for the cutting task at hand. 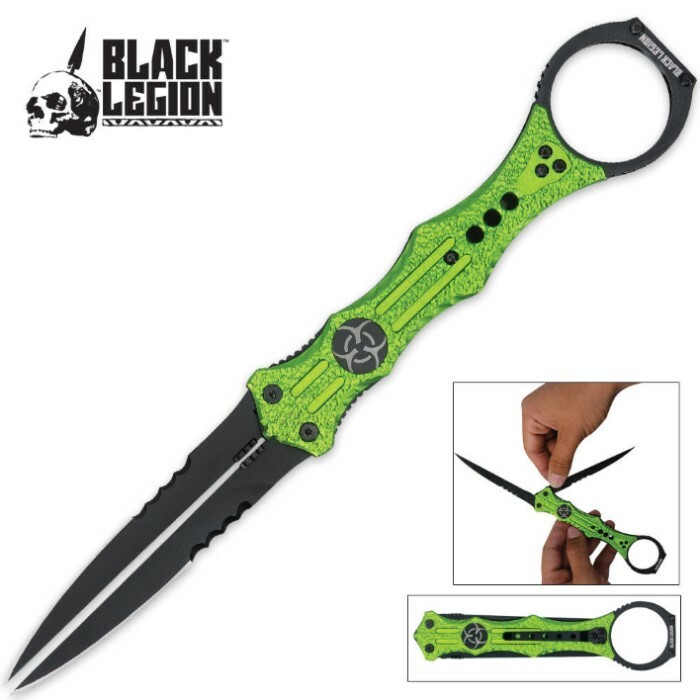 Other features of this pocket knife include stainless steel blades, partially serrated combo edges, biohazard emblem, pocket clip, and a karambit style steel ring. Measurements: 6 in. closed and 9 3/4 in. opened. Had been considering picking this one up for a while. I just did and am very pleased! Looks a lot better than in the pictures; be sure and watch the video. First off, the color is a richer, darker green (too light in the pics). Also, is a lot bigger than it appears. The detail on the handle it great and really has a nice metallic look to it. I don't get why people are complaining "it's not a true butterfly". It clearly shows what you get. Love it! This is NOT a 'butterfly knife' but a split blade liner lock. Cool knife and fun to show off. My only problem is that it is misrepresented as a butterfly knife. It is not a butterfly knife. Still good though. I really like the design on it, as well as it's sharpness. This can act as a great zombie/apocalypse fan, pocket knife, as it is sharp out from the box. I like it's shiny color, and how it locks in action, ready to cut up anything. This really isn't a butterfly knife but a split-blade folding knife. The blades are sharp but somewhat thin and lock in place well. The handle seems a bit flimsy, not much weight to it. The ring seems almost unnecessary. Looks cool but could have been designed better.